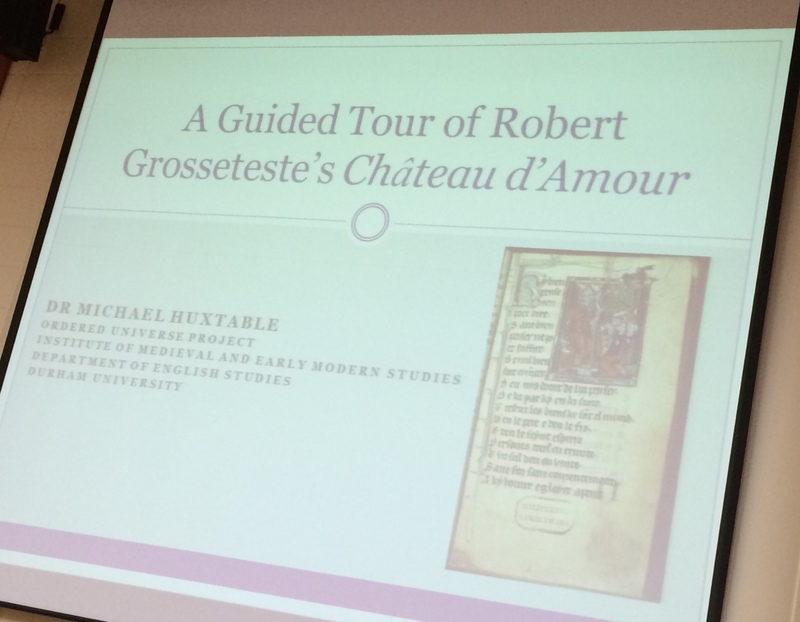 Last week, on Friday 9th October, Michael Huxtable gave his lecture ‘A Guided Tour of the Chateau d’Amour’ as the Annual Bishop Grosseteste Lecture, at Bishop Grosseteste University, Lincoln. The 9th, at least according to the Anglican canon, is the commemorative day for Grosseteste, and the lecture was given in collaboration with Lincoln Cathedral. Michael’s lecture, on Grosseteste’s wonderful, image-heavy, poem of the fall and redemption of humanity, could not have been more appropriate for the occasion. 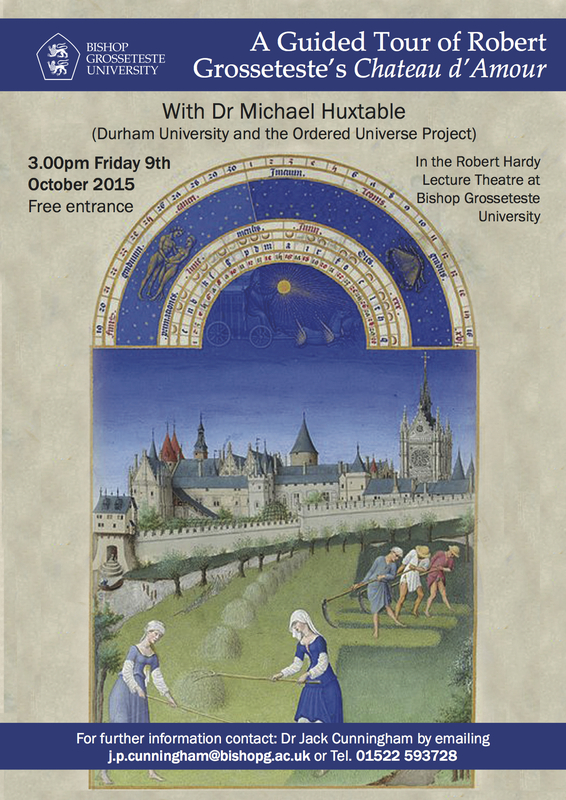 To a full auditorium in the Robert Hardy theatre, Michael presented a tour-de-force of learning and sensitive reading, placing the Anglo-Norman poem, its allegory of the Virgin Mary as Castle, and extended commentary on the redemption of creation, into a series of contexts. These included the audience of the poem, with discussion of the most probable date (sometime in Grosseteste’s regency in theology, so late 1220s to 1235, according to Mackie, and followed by Michael) and purpose for the text. Of the 18 manuscripts, of the work, Michael showed the illustrated version from the 14th century in Lambeth 522, including the bishop, presumably Grosseteste himself, teaching a crowd. The place of the poem within Grosseteste’s other writings was raised; its place attuned to his primary interest in pastoral care, for a Franciscan audience, perhaps rather than the courtly audience supposed by earlier commentators. The relationship with the scientific commentaries and expositions, philosophical and theological treatises, and other pastoral writing formed a consistent undercurrent for the lecture. From the beginning of the poem, the assertion of the need for right speech recalls the purpose of the treatise On the Liberal Arts and near its ending, the reader/listener encounters the Virgin Mary clothed in a rainbow. Grosseteste would have been writing the treatise On the Rainbow in the same years as the Chateau d’amour. So, while the purpose of the poem is different, the unity of Grosseteste’s thought, the use of natural imagery, and the driving purpose to bring Creation to its Creator, through Christ, and salvation, is everywhere apparent. Michael did, as promised, guide his audience through the poem’s structure, from the long re-telling of the King and his 4 daughters Mercy, Truth, Justice and Peace, an allegory of the need for the incarnation. The daughters argue over the fate of a vassal of the King; Peace provides the resolution, along with the Son of the King, that he will take on the burden’s of the vassal. The Messianic names in Isaiah (think Handel ‘Wonderful, Counsellor, the Mighty God….’); the loss and restoration of creation; and then the famous description of the Castle. Here Michael gave a more detailed treatment of the Castle as Temple, and the influence of the early 5th century Prudentius’s Psychomachia on Grosseteste’s allegory of the Castle and the Virgin. 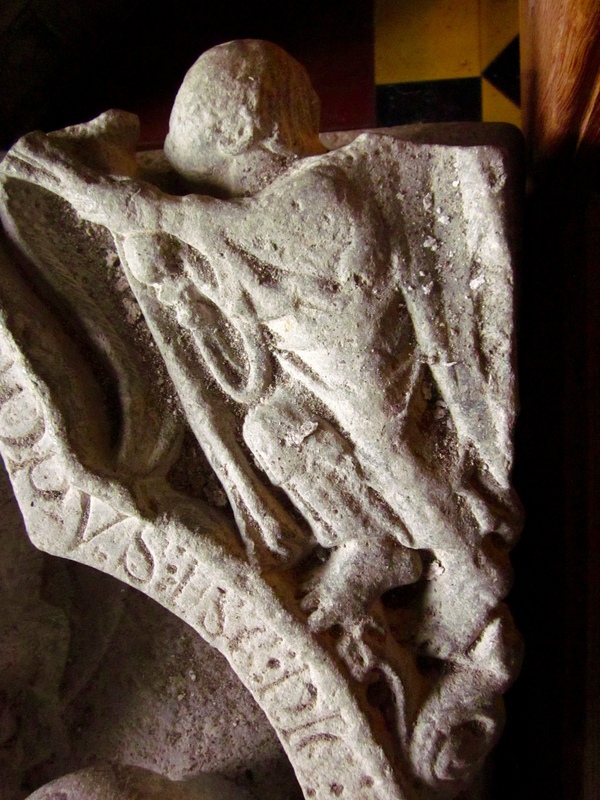 A particular theme for Michael was the translation of the Chateau d’amour into Middle English as the Castell of Love, and the extended influence of Grosseteste’s text as a result. Taken with the translation of other of Grosseteste’s works into Middle English, the De colore (in Trevisa’s translation of Bartolomaeus Anglicus) as Michael has established in the Ordered Universe edition of the text, and sections of the De generatione sonorum/De artibus liberalibus on which the Ordered Universe team are working currently. The vernacular Grosseteste is equally as image-driven as the Grosseteste of the schools, and Mike finished by reminding the audience of the power and capacity of the medieval imagination. 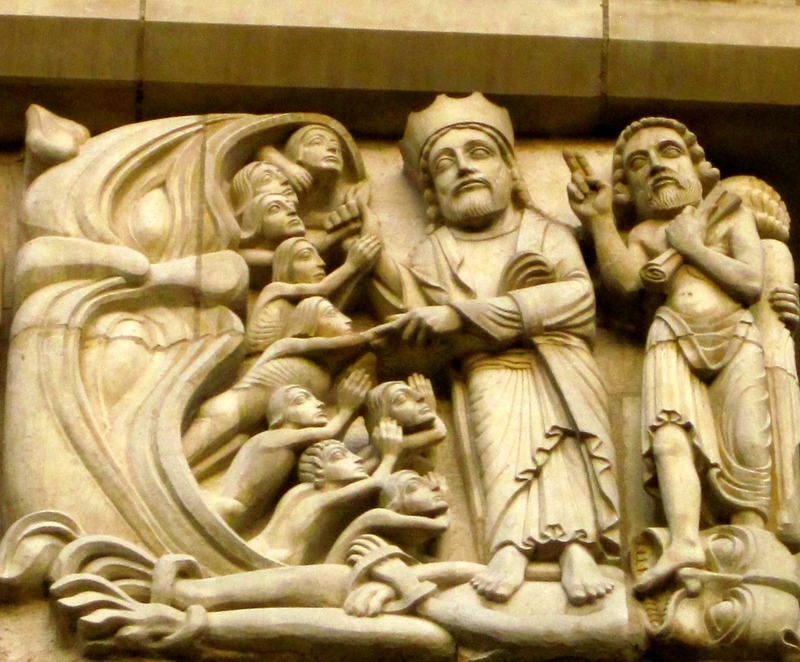 The complexity and range of Grosseteste’s image-making and composition are exemplified in the Chateau d’Amour. The purpose of that creativity shines through as well, and at its author’s fundamental values, which focus concern for others in all walks of life. It was a wonderful tour, and a fitting way to celebrate Grosseteste’s life and the capacity of his works to captivate and fascinate. The organisation of the lecture was seamless, in the capable hands of Jack Cunningham, and the questions afterwards wide-ranging and stimulating, drawing on the richness of the text, and the lecture. Next Article Scribal loyalties: A note from a new post-doc.